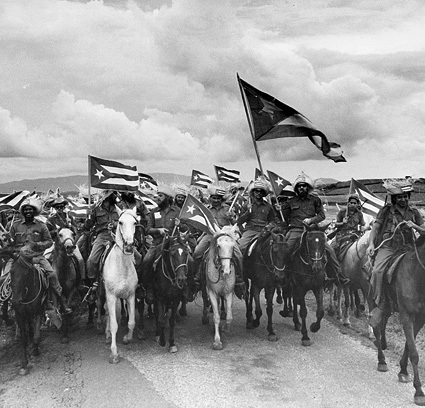 Revolución: Five Visions reframes the Cuban revolution through the art of photography, telling the personal stories of five photographers whose lives and work span nearly five decades of Cuban history. Shot on 24P hi-definition video by Mexico’s premiere director of photography, Chuy Chavez, the film is a breathtaking visual exploration of Cuba yesterday and today. For more than a century, Cuba has dared to defy the “Yankee imperialists” 90 miles to its north. Since the triumph of Fidel Castro’s revolution, Cuba has also dared to dream of realizing a utopian society. Yet despite the revolution’s many achievements, such as providing health care and education to nearly all Cubans, the cost has been severe—a matter of life and death for thousands of Cubans and the exile of thousands more. Those who remain on the island have suffered limits to their individual freedoms as well as the effects of crippling economic sanctions. To some, the revolution is a celebrated success. To others, it is a dictatorship. And to many more, it falls somewhere in between. With Cuba on the brink of radical transformation and the U.S. embargo clearly outdated, it is necessary to form a new way of understanding the Cuban revolution which transcends the overly simplistic pro-Castro versus anti-Castro dialogue. Through the work of five photographers, Revolución offers a multi-faceted vision of the rise and fall of the revolutionary dream in Cuba. In 1959, Fidel Castro recognized the mesmerizing power of images and selected a group of photographers to “tell the story of the revolution in pictures.” Raúl Corrales was amongst those chosen and soon became the official photographer “acompagñante” (companion) of Fidel Castro. Born and raised in the poor Cuban countryside, Corrales was an eager participant and believer in the utopian dream unfolding before his lens. He remained a faithful Fidelista, sharing the beliefs that once inspired him as a Cuban and as a photographer. .José Figueroa belongs to the next generation of photographers. His doubts about the revolution contrast with Corrales’s romanticism and emerge in his photography. Deftly able to convey what is visible as well as what is hidden, Figueroa’s personal, artistic voice emerges clearly and is testimony to the coming shift in the role and use of the photographic image. Rogelio “Gory” López Marin came to photography through the arts in the 1980s. His surreal, constructed images are a radical departure from the documentary work that defined photographic tradition in Cuba and was accepted by government censors. Photography was his only escape until he left for Miami, and his work defined a new relationship between photography and reality in Cuba. When the Soviet Union fell, Cuba was thrown into an economic crisis. In the early 1990s, many artists fled Cuba, and those remaining were forced to reconcile the individual creative impulse with the demands of a collective society and those of surviving a severe economic crisis. REVOLUCION listens carefully to the pulse of present-day Cuba through the work of Manuel Piña and René Peña. Determined, resourceful and resilient, Peña himself is the subject of his images, which he creates despite severe shortage of materials, from water to photographic paper. Piña, who grew up believing in the collective dream, laments the disappearance of the utopia. His conceptual photography blends documentary and fiction to raise awareness about the manipulative power of utopias and images, not only in Cuba, but also throughout the modern world. These new generations of photographic artists continue to tell the story of the ongoing revolution in pictures. The story they tell, though, is very different from the one Castro set out to convey. Today, Cuban photographers use the medium to express dissent, criticism and their own ideas of history and truth. Whether it is the passionate resistance of the revolutionary or the individual artist’s struggle to emerge as an independent voice in a collective society, the photographers in Revolución reveal the defiance of revolutionaries and artists alike and discover the power of art to liberate. Nicole Cattell is a 2003 Guggenheim Fellow, a 2004 New York Foundation for the Arts Fellow and an award-winning documentary producer and director. She has been named by Filmmaker magazine as one of the 25 New Faces in Independent Film. Her first documentary was the Emmy award-winning Come Unto Me: The Faces of Tyree Guyton, a much-heralded portrait of a Detroit artist and his several-block outdoor art installation called The Heidelberg Project. The film garnered numerous festival awards, including three Best Documentary awards and an Honorable Mention at the Sundance Film Festival. Come Unto Me aired on the Cinemax Reel Life Series, received European television distribution and a limited U.S. theatrical run. It continues to be featured in museums across the country, including New York City’s Museum of American Folk Art, Boston’s Museum of Fine Art and the Detroit Institute of Art. Cattell was the recent recipient of a grant from the New York State Council for the Arts for her documentary Mermaids: The Documentary which is currently in development. Cattell, who received her Master’s Degree from University of Michigan, has been a freelance writer, director and producer in New York City for nine years, with clients including WNET, Nickelodeon, Maysles Films, Fitzgerald Brunetti, Volvo Cars of North America, Mercedes Benz and American Express. She has also recently completed several videos for the American Institute of Architects, including a profile of the internationally acclaimed architect Santiago Calatrava. Revolución: Five Visions is a co-production of El Sueño Pictures, LLC and the Independent Television Service (ITVS), with funding provided by the Corporation for Public Broadcasting (CPB), in association with One Light Pictures and Latino Public Broadcasting (LPB). This program was produced by El Sueño Pictures, LLC which is solely responsible for its content. ©2006, El Sueño Pictures, LLC. All Rights Reserved.